Hydrological extremes are amongst the most devastating forms of natural disasters both in terms of lives lost and socio-economic impacts. There is consequently an imperative to robustly estimate the frequency and magnitude of hydrological extremes. Traditionally, engineers have employed purely statistical approaches to the estimation of flood risk. For example, for an observed hydrological timeseries, each annual maximum flood is extracted and a frequency distribution is fit to these data. The fitted distribution is then extrapolated to provide an estimate of the required design risk (i.e. the 1% Annual Exceedance Probability – AEP). Such traditional approaches are overly simplistic in that risk is implicitly assumed to be static, in other words, that climatological processes are assumed to be randomly distributed in time. In this study, flood risk estimates are evaluated with regards to traditional statistical approaches as well as Pacific Decadal Oscillation (PDO)/El Niño- Southern Oscillation (ENSO) conditional estimates for a flood-prone catchment in eastern Australia. A paleoreconstruction of pre-instrumental PDO/ENSO occurrence is then employed to estimate uncertainty associated with the estimation of the 1% AEP flood. 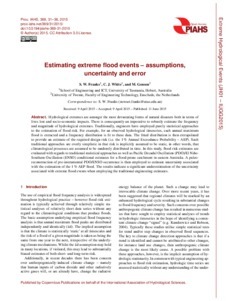 The results indicate a significant underestimation of the uncertainty associated with extreme flood events when employing the traditional engineering estimates.